Everyone knows that Google lets you search billions of web pages. But few people realize that Google also gives you hundreds of cool ways to organize and play with information. Since we released the last edition of this bestselling book, Google has added many new features and services to its expanding universe: Google Earth, Google Talk, Google Maps, Google Blog Search, Video Search, Music Search, Google Base, Google Reader, and Google Desktop among them. We've found ways to get these new services to do even more. 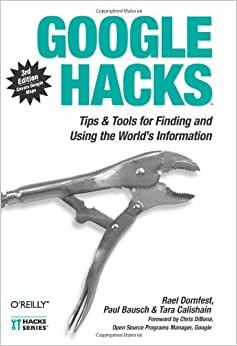 The expanded third edition of Google Hacks is a brand-new and infinitely more useful book for this powerful search engine. You'll not only find dozens of hacks for the new Google services, but plenty of updated tips, tricks and scripts for hacking the old ones. Now you can make a Google Earth movie, visualize your web site traffic with Google Analytics, post pictures to your blog with Picasa, or access Gmail in your favorite email client. Industrial strength and real-world tested, this new collection enables you to mine a ton of information within Google's reach. And have a lot of fun while doing it: * Search Google over IM with a Google Talk bot * Build a customized Google Map and add it to your own web site * Cover your searching tracks and take back your browsing privacy * Turn any Google query into an RSS feed that you can monitor in Google Reader or the newsreader of your choice * Keep tabs on blogs in new, useful ways * Turn Gmail into an external hard drive for Windows, Mac, or Linux * Beef up your web pages with search, ads, news feeds, and more * Program Google with the Google API and language of your choice For those of you concerned about Google as an emerging Big Brother, this new edition also offers advice and concrete tips for protecting your privacy. Get into the world of Google and bend it to your will! Rael Dornfest is Chief Technology Officer at O'Reilly Media. He assesses, experiments, programs, fiddles, fidgets, and writes for the O'Reilly Network and various O'Reilly publications. Rael is Series Editor of the O'Reilly Hacks series and has edited, contributed to, and co-authored various O'Reilly books, including Mac OS X Panther Hacks, Mac OS X Hacks, Google Hacks, Essential Blogging, and Peer to Peer: Harnessing the Power of Disruptive Technologies. He is also Program Chair for the O'Reilly Emerging Technology Conference. In his copious free time, Rael develops bits and bobs of freeware, particularly the Blosxom weblog application, is Editor in Chief of MobileWhack, and (more often than not) maintains his Raelity Bytes weblog. Paul Bausch is a co-creator of the weblog software Blogger, maintains a directory of Oregon-based weblogs at ORblogs.com, and is the author of the forthcoming Yahoo! Hacks. Among his recent applications is BookWatch, a site that scans weblogs for book mentions, analyzes them to find the most frequently mentioned books, and uses the Amazon API to display the results. Paul is also an accomplished writer, and is the co-author of We Blog: Publishing Online with Weblogs, published by Wiley; and Amazon Hacks, from O'Reilly Media. Tara Calishain is the creator of the site, ResearchBuzz. She is an expert on Internet search engines and how they can be used effectively in business situations. A few years ago someone had mentioned this book to me if I was interested in learning the next level of Google. I was able to locate it at my local library and continued to check this book out over several months. This is a great reference for understanding the dynamics of the search capabilities within Google. I wouldn't treat this book like a one time beginning to end chapter book but as an ongoing guide for quick tips. Combine this book with what you are working on in Google Adwords, Google Adsense and Google Analytics. Without any other prior knowledge of managing SEO Content I took this book as my literal guide to build my ranking on Google and it works! Well worth the investment. I didn't even know some of these features existed! Great book. My Internet time is more efficiently spent since I started reading this book.